With an interest in cinema tracing back to the 1960s, an involvement in video and new media art since the 1980s, coupled with a deep understanding of shifting tendencies in criticism and theory, Australian artist, critic and writer John Conomos is inimitably placed to examine transgeneric relationships in moving image culture. Drawing upon filmmakers and theorists, video and new media artists, cultural theorists and philosophers past and present, Mutant Media: Essays on Cinema, Video Art and New Media is an innovatory and speculative exploration of historical, contemporary and potential interactions between cinema, art, poetry, criticism and technology. Framing much of his material around filmmaker and theorist Jean-Luc Godard, Conomos is a champion of artists, filmmakers and theorists that refuse conventional dialectical boundaries. From Alfred Hitchcock to Chris Marker to Jeffrey Shaw, the terrain covered in this series of essays is expansive. Unlike some new media writers, Conomos is particularly interested in ideas that do not set newer developments in moving image culture against cinema, but conversely, see cinema as a device with which to understand variations of the moving image as they mutate across the “borders of media”. This thinking through cinema becomes a useful device for reconsidering the idea of cinema. In this context, apocalyptic or utopian calls for the end of cinema can be seen as paradoxically dependent upon the idea of cinema. In itself a hybrid formation, Conomos demonstrates cinema’s potential to mutate, as a reflection of, and in reaction to, newer technologies and cultural contexts. For Conomos, cinema is a political, phenomenological, existential, self-reflexive and an experimental medium. Throw the inextricable historical influence of the still image into the mix, consider the unresolved collision of poetry and anti-aesthetic criticism, introduce video and interactive computer technologies, acknowledge the literary and philosophical underpinnings of our moving image culture, and you will have some sense of the rich playground that is Mutant Media. Working upon the ideas of French critic and theorist Raymond Bellour, Conomos suggests that the introduction of newer forms of screen-based new media do not necessarily present a challenge to the idea of cinema but are perhaps instead evidence that it is alive and mutating across and through time and remediated technologies. Musing upon the paradoxically closed-minded claims of those who call for the “death” or “end” of incarnations with which they are clearly only specifically familiar, Conomos calls for a speculative, experimental and interconnected relationship with and between all forms of screen-based media. There is no need to throw any babies out with their proverbial bathwaters. We might instead find small “t” truths floating within the spaces “in between”. Conomos is less interested in ideas that parade a wholesale rejection of the idea of cinema than a fluid rethinking of its definitions and parameters in relationship to emerging technologies and cultural paradigms. For Conomos, there is not one single notion of cinema, but rather many disparate, criss-crossing and intertwining ones. Reminding us that even cinema in its classical form is in itself a hybrid formation, Conomos demonstrates that the “in between” is a fertile space. Personally predisposed to moving “in between” – being Greek and Australian, a cinephile and a video artist, a poet and a theorist, an artist and a writer, a practitioner and an educator – Conomos joins the company of thinkers that inspire reconsideration of perceived oppositionalities. At its rare best, Australia is a place that can capitalise on being midway between the primary cultural exporters of North America, Europe and now Asia. As a cultural importer, it is occasionally capable of hybridising derivative cultural formations, producing works, ideas and observations not necessarily possible within perceived centres. Not that its imported cultural infrastructure will typically be ready to recognise or support these rare moments, however. It is a theme long played out, variously implied within Mutant Media, and that might now sadly be extended to this exceptional book itself. For Conomos, the oft-alleged dichotomy between cinema and other formations of moving image culture (such as television, video, the Internet, virtual reality and video installation) is not really worth sustaining. Surely all can comfortably coexist as different interfaces for complementary ideas? Despite the claims of its various factions, it is probable that the expanded field of moving image culture actually exists as a consequence of the unresolved tension between its many antithetical constructions. If we do indeed exist within a post-movement, post-disciplinary era, we must be capable of transcending the factional residue of such divides. Does art, in its broadest sense, not exist as an interface for certain forms of human expression precisely because it can communicate ideas that exist outside of more conventional forms of language or expression? It is finally as pointless to pit cinema against so-called new media as it is to pit poetic aesthetics against the politically-charged criticality of so-called anti-aesthetic cultural formations. Like art, cinema is read against a shifting balance of symbolic, strategic, perceptive, technical, cognitive, social, political, semantic, and ideological concerns. Cinema is alive and mutating as both a form and as an idea within the plurality of contemporary cultural production. There is clearly no longer one dominant or uniquely relevant theory or tendency, nor much common ground between theories or tendencies. Every attempt to forward a critical totalitarianism masquerading as an antidote or utopia has fallen prey to paradox. In recent decades, the arts have become increasingly resistant to medium- or discipline-specific categorisation. Newer forms of categorisation, framed in terms of critical and conceptual genealogies, have given rise, for better or worse, to language that spans former disciplinary divides. Contemporary culture is produced and interpreted against a constantly shifting balance of symbolic, strategic, perceptive, technical, cognitive, social, political, semantic, poetic and ideological concerns. It is clearly intellectually irresponsible to attempt a description of moving image culture within any single paradigm. Conomos avoids this trap beautifully, instead dancing in a sometimes-autobiographical mode though the wealth of observations, anecdotes and quotations that have informed his creative life. For the poet, a reduction of an appreciation of the arts to a “text” to be “read” and decoded, although useful, is finally unsatisfactory. The landscape that we actually inhabit is thankfully somewhere “in between” polarities such as theory and practice. For thinkers such as Conomos, as an artist and a writer, such polarities are not opponents but rather companions. Criticism that can confidently poke its head above this landscape must display an awareness of its internal contradictions without being constipated or consumed by its theoretical baggage. For Conomos, answers are floating and intriguingly unresolvable. It is an old cliché, but it is the questions that remain important. After all, this is subject matter fraught with contradiction, from the paradoxical stillness of the movie image, to the photographic image itself, which of course simultaneously captures reality yet holds it distant. Reduced in parts to a series of quotes, lists of practitioners, and a generous use of analogy, Conomos wants to reveal his arguments to the reader, not declare their authority. Like his exemplars and protagonists, Conomos is poetically consistent. His is a style of writing which is potentially rewarding or frustrating depending on whether the reader is comfortable within the inconclusive and contradictory worlds that the essays inhabit and reflect. Like art itself, it leads the reader toward multiple interpretations or postulations rather than to neatly framed formations that are resistant to difference. Such an approach is less about any dilution of scholarly consistency than the text engaging with the inherently slippery terrain of its subject matter. Some readers will invariably find the speculative uncertainties and lists of inconclusive possibilities presented in this collection of essays irritating. But his very style, in and of itself, is surely an intellectually honest, appropriate and playful response to the myriad interconnected complexities of screen-based culture. Like a preview channel, Conomos skips between worlds, continents, media, quotations, analogies, reflections and histories as if to demonstrate the kind of relationships needed to navigate the spaces in between the narrative and poetic structures of cinema and the speculative open-ended world of remediated moving image formations. Like its slippery sister formations, video art has until relatively recently asserted little independent essence. It was defined against that which it was other to: cinema, television, photography, painting, etc. By contrast, video art is now so omnipresent that it is easy to forget its decades of relative obscurity. Conomos has long worked to help support the vital yet flimsy bridge between cinema and so-called new media. In Mutant Media, Conomos aims “to delineate critical debates about the convergence taking place between celluloid cinema and new technologies” (p. 196). This he achieves. Moreover, he alludes to a space in which filmmakers and artists might share a consideration of their work in terms of how it operates as a carrier of meaning within lived and bodily experience and a reflexive awareness of the inevitable gap between intention and reception. The epistemology of process that has characterised advanced cultural production for several decades is the movement of thought across mediums. For Conomos, cinema provides one interface. For others, it might be architecture, music or philosophy. Perhaps, once we become critically engaged with any medium, it becomes exponentially easier to transpose that engagement anywhere else. To see the world critically, reflexively, philosophically or poetically, is to see the world anew. There are many interfaces that might enable this transformation. Just as Friedrich Nietzsche once described his lonely philosophical flights, noting that “near and nearest things” now somehow seemed “transformed” (1), art is simply another means with which the mystery in which things can become other things might be contemplated. In a complex and rapidly changing social and cultural landscape, specific knowledge is potentially less transferable to newer or emerging contexts than a critically reflexive level of engagement with culture itself. Not simply looking, but noting from where and how one is looking, is potentially an infinitely transposable skill. In a cultural landscape defined as much by bodily, linguistic, social and digital formations as it is by traditional media, cinema and its remediated screen-based descendent formations have, and will find, new means with which to intervene. Any attempt to navigate the “in between” spaces of moving image culture confronts formidable challenges. Although somewhat connected under the rubric of critical theory and popular culture, cinema and contemporary art can nonetheless employ quite specialised rhetoric and references. The author must somehow avoid generalisations. The author should also possess a deep understanding of the disparate elements that his or her subject is supposedly “in between”. In this series of idiosyncratic essays, Conomos achieves a remarkable degree of success in meeting these demands. He makes a sustained assault on the prejudices and self-inflicted limitations of existing moving image and new media theory and presents his speculative summaries in a remarkably lucid yet playfully poetic style that is refreshingly free of constipated theoretical jargon. Instead, significant themes consistently duck and weave through an encyclopedic array of quotations, disclaimers and assertions. There are some quibbles. Sometimes the sidetracks, quotations and lists of key figures can distract from the point. Some points are unnecessarily repeated. But, as with any collection of discrete essays from a consistent mind worked together into a single volume, this is probably inevitable. Distractions aside, Mutant Media is an inspiring, open-ended survey of the coalfaces of moving image culture, meticulous yet wandering, readable yet challenging, informative yet partly autobiographical. For a single work at the intersection of cinema, film criticism and theory, video art and new media, it is certainly an impressive template. 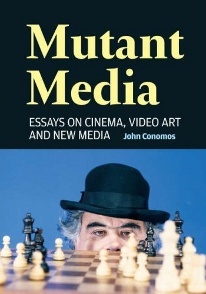 Mutant Media: Essays on Cinema, Video Art and New Media, by John Conomos, Artspace and Power Publications, Sydney, 2007. Friedrich Nietzsche, “Preface”, Human, All Too Human , trans. Marion Faber with Stephen Lehmann, University of Nebraska Press, Lincoln, 1996, p. 8. Dr Sean Lowry is a Sydney-based artist, musician and writer and Lecturer in Creative Arts at the University of Newcastle. His latest video work Lapdancer2: a series of popular songs reinterpreted within the moving image was recently showcased at MOP Projects in Sydney.